2009 has given us plenty to talk about when it comes to singles. Some left us speechless with their brilliance while others left us speechless for not-so-good reasons. Some we couldn’t stop singing all year and some we wished we could stop singing. Yes, there were some awful songs released this year but here I’m sharing my top 5 favorite singles of the year. For asking out the homecoming queen. When Brad isn’t singing about ticks and alcohol, he sure knows how to get serious and deliver some of the most influential songs. Miranda Lambert knows a great girl-done-wrong song when she sees one and her latest smash is no exception. A story about a woman’s significant other cheating on her with everyone woman in town and lying about it is the backdrop to this 2009 hit. Unlike her other songs that follow in the same vein, Lambert adds a twist at the end of the song unveiling she’s a cheater too. The song further cements Lambert as a mainstream traditionalist by including a prominent guitar melody and plenty of steel guitar in the background. The vocals are delivered with such conviction that make you believe Lambert has gone through the experience before. 2009 wouldn’t have been the same without this breath of fresh air song. Lady Antebellum’s chart topping smash finds Charles Kelley and Hillary Scott singing about the joy of having one another to run to while things get rough. The voices of Kelley and Scott mesh so well that you almost feel like they’re singing to one another. Adding third member Dave Haywood’s harmonies makes the song’s vocals stellar while the production makes it one of the year’s best feel-good songs. Country music lovers couldn’t stop walking around singing this song and neither could the music industry, seeing as the CMA voted it as Single of the Year. This is, no doubt, Lady A’s door-busting, breakthrough hit. Yes, yes, I know…I’m a tad obsessed with Lady Antebellum. However, my obsession isn’t unwarranted. With their second chart-topping single of the year, Lady Antebellum deliver a song about a couple’s dependency on one another. The story starts with the lady of Lady A, Hillary Scott, looking through old pictures of a failed relationship while trying to fight the urge to reach for the phone and call her ex-flame. At the same time, Charles Kelley sings about drinking his pain away with “another shot of whiskey” while hoping the girl he loves comes “sweeping in” the door like she used to do in happier times. Both tattered souls reflect on how much they need each other and how difficult it is to resist the urge of each other’s love. The song spent an astonishing 5 weeks atop the country singles chart and made Lady Antebellum one of the year’s most played artists. Though the song has only been on the charts for four weeks, it’s brilliant enough to top my list of favorite singles of 2009. In this tear jerking song, Underwood masterfully reflects on how life on earth is just a “temporary home.” She narrates the stories of 3 people, a young foster boy who spends his life going from home to home to a young single mom telling her baby girl they’ll “find their place in this world” to an elderly man realizing his life on earth was just a window and door he had to pass through to reach his ‘home.’ The lyrics of the song aren’t the only thing that make the song a masterpiece. Carrie’s vocals are stellar as she controls her voice from a whisper to a more meaningful tone, as shown when she sings the chorus after telling the single mom’s story. Underwood’s “Temporary Home” is Carrie’s finest single to date and is, no doubt, 2009’s best single…at least in my opinion. As 2009 comes to a close, I’ll be sharing my top 5 favorite artists, singles, and albums of the past year. Country music in 2009 can be summed up by one single artist…Taylor Swift. She’s broken countless chart records, sold millions of albums, and racked up a ton of awards all at the tender age of 20. Though she’s been the hottest thing in 2009, she failed to make my top 5 list of favorite artists, mainly due to the fact that I view her mainly as a pop artist. Here are my top 5 favorite artists of 2009. Brad Paisley has had another stellar year including 2 more number singles with “Then,” and “Welcome to the Future.” He was named Male Vocalist of the Year by both the CMA and ACM and he co-hosted the CMA awards for the second year in a row. But what makes Brad one of my favorite artists of 2009 is the release of his album American Saturday Night. No doubt is the album one of his finest, but it also showcases him as one of the best mainstream traditionalists in country music. Sugarland continued their rise to country superstardom in 2009 with singles such as “It Happens,” “Love,” and their current heartwrenching ballad “Keep You.” They earned the CMA for Duo of the Year and what they did during their acceptance speech is what helped them make my list. While accepting their award, they invited Brook & Dunn up onstage to say a few words as a goodbye to the CMA awards (B&D will retire after their Last Rodeo tour). Their grace and unselfishness is what makes Jennifer Nettles and Kristian Bush one of country’s finest artists. Keith Urban has continued his strong career by topping the charts with his recent album Defying Gravity which yielded singles like “Sweet Thing,” “Kiss a Girl,” and “Only You Can Love Me This Way.” But the reason Urban has landed on my list is his stellar stage performances. During his Escape Together World tour, Urban entertained crowds with his brilliant guitar skills and smooth voice all with little glitz and glam. His shows always ranked high on my list of best concerts of the year and this show was no exception. Though 2009 was a quiet year for Carrie Underwood, she still managed to make my list of top 5 favorite artists of the year. She continued her dominance at radio by adding two more number 1 songs to her credit (“I Told You So” and “Cowboy Casanova”) and she released her third album, Play On. She was also named the ACM’s Entertainer of the Year. However, the reason she made my list was her excellent stint as co-host of this year’s CMA awards. From joking around with co-host Brad Paisley about the fragrances of Tim McGraw and Faith Hill to brilliantly singing parodies of country classics like “Mama’s Don’t Let Your Babies Grow Up to be Cowboys” and “D-I-V-O-R-C-E,” Carrie all but sealed the hosting job for the next few years to come. Lady Antebellum can throw the title of ‘newcomer’ away because they’ve cemented themselves as country’s latest “it” group in 2009. They’re accolades are the reason they topped my list of favorite artists of 2009. 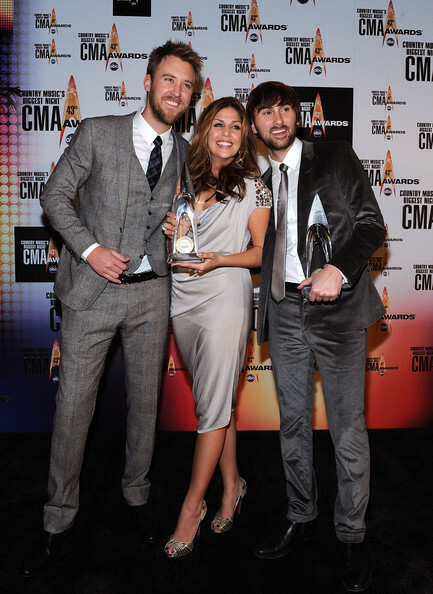 They earned their first number 1 song with “I Run to You” which nabbed them the CMA Single of the Year trophy. They’re debut album was certified gold early in the year and then platinum towards the end of ’09. The lead off single from their sophomore album Need You Now spent five weeks at number 1. They earned the CMA Vocal Group of the Year trophy at this year’s CMA awards ending the reign of supergroup Rascal Flatts. Yea, it’s safe to say Lady A have had the best year of their career and I see a bigger year for them in 2010. Welcome to All Things Country! Hello everyone! Welcome to my All Things Country blog! My name is Aaron and I’m a huge country music fan. I’ve been listening to country music my entire life and have rarely listened to anything else. I grew up listening to the sounds of George Jones, Loretta Lynn, Merle Haggard, and all the other legends of country music. Now I’m currently digging the new “mainstream” country sounds that artists like Keith Urban, Carrie Underwood, Brad Paisley, and Lady Antebellum provide. The purpose of this blog is to discuss my opinions on country music and to share reviews of albums, singles, videos, etc. I look forward to sharing my passion for country music with all of you and I hope you all enjoy it!